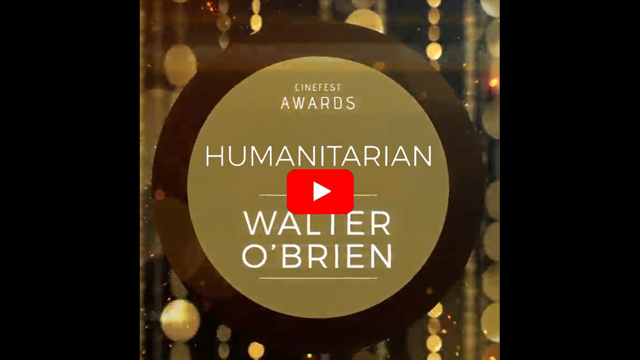 LOS ANGELES, April 10, 2018	(Newswire.com) - Walter O’Brien, founder and CEO of Scorpion Computer Services and Executive Producer of CBS’s hit television show “Scorpion,” received the Humanitarian Award at the fifth edition of the North Hollywood CineFest for his donated time and expertise to advise, provide intelligence to, protect the identities of and execute anti-kidnapping and anti-human trafficking missions for over a decade. The CineFest awards show was new to NoHo’s program this year and took place at the El Portal Theater on March 30, 2018. 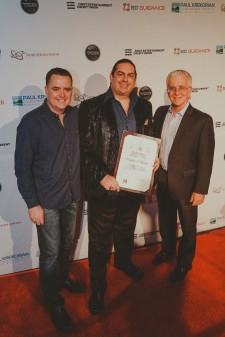 CineFest gave three special awards. In addition to the Humanitarian award, an “Innovation & Inclusion Award” was presented to MinTIC Colombia for their program Cine Para Todos, a phone app that syncs to the movies in the theater and provides closed captioning for the hearing impaired and an audible description of action for the vision impaired. Last, the “Visionary Artist Award” was presented to Siddhali Shree, director of Stopping Traffic, a documentary about human trafficking. This is not the first time O’Brien has been honored for his humanitarian efforts. In April of 2017, O’Brien became the youngest recipient of the Celebrity ICON Humanitarian Lifetime Achievement award at Unite4:Good’s Unite4:Humanity gala for his work in charitable ventures which create positive societal change. His other philanthropic works are numerous, including Code Wars, California State Science Fair, MENSA, MIT Technology Review, the Junior Achievement Conference, Project ECHO, Superhero Brain and Houston Technology Center. He also received C-Suite Quarterly’s Visionary award in 2017 and funded Kilkenny’s Taxi Watch, a suicide-prevention program that has saved more than 130 lives since its inception in 2014. Located in the heart of the NoHo Arts District in Los Angeles, the North Hollywood CineFest has established itself as a premier event for independent cinema from all over the world. By combining a vibrant local social scene with a state-of-the-art cinema, every filmmaker and film lover is sure to be impressed and delighted with the theater and surrounding location. The combination of great film screenings, press and red carpet events, parties, seminars, all offered in this seven-day event, is what makes this a dynamic and must-go film festival. Walter O’Brien is the founder and CEO of Scorpion Computer Services, Inc., and CEO of Scorpion Studios. He is the Executive Producer and the inspiration behind the hit CBS television drama, Scorpion, with over 26 million viewers in the U.S. and airing in 188 countries. The U.S. Department of Homeland Security has certified Walter O'Brien as being a person of national interest to the United States and granted him an Extraordinary Ability EB 1-1 Visa. He has worked with the U.S. Department of Homeland Security, plus Navy and Air Force systems to deploy artificial intelligence that protects American military personnel. Walter was recently recognized by the Fort Wayne Base Community Council for saving countless lives and awarded a member’s Combat Infantry Badge and Battle Dress Uniform from Operation Desert Storm. The Northeast Indiana Defense Industry Association recognized O’Brien’s tremendous support of defense initiatives. Walter was the youngest recipient of Unite4:Good’s Humanitarian Lifetime Achievement Award, and in 2017 won C-Suite Quarterly’s Visionary award. In addition, he has worked with multiple Fortune 500 companies including the world’s largest mutual fund, Fujitsu, Trados, Oracle Corporation, Baltimore Technologies and Critical Path. O’Brien serves as chairman or former board member for Strike Force Solutions, Talentorum Alliance, Lawloop and previously served on the boards of Houston Technology Center, American Environmental Energy, Starglobe and Toin Corp.
O’Brien regularly donates his time to charities and the community in general, to encourage all generations to celebrate intelligence. O’Brien provided the seed funding for TaxiWatch Kilkenny, a suicide prevention program that has saved over 133 lives since its inception in 2015. Often appearing on CNBC, Fox News and CBS as an expert on computer security, O’Brien has contributed to XPRIZE selection as part of XPRIZE Visioneering. LOS ANGELES, April 13, 2018 /PRNewswire/ -- The project "Cine Para Todos" (Movies for Everyone), created by MinTIC Colombia, received recognition at the fifth edition of the North Hollywood CineFest with the Innovation and Inclusion Award. This award acknowledges the project as the most innovative technology that will serve the greater good for the public in the world of entertainment. "Cine Para Todos" is a social inclusion project that allows people with visual, auditory and/or cognitive disabilities to enjoy studio and independent films at major movie theaters free of charge. Part of their program is the development and free distribution of a smart phone application that syncs to the movie in the theater and provides closed captions and sign language for the hearing impaired, and an audible description of the action for the visually impaired. This project deserved recognition for the positive impact it brings to the quality of life of people with disabilities. The NoHo CineFest awards show took place at the legendary El Portal Theater on March 30, 2018. CineFest gave two other special awards in addition to the Innovation & Inclusion Award. A "Humanitarian" award was presented to Walter O'Brien, Executive Producer of CBS's hit television show "Scorpion," for his donated time and expertise to advise, provide intelligence to, protect the identities of, and execute anti-kidnapping and anti-human trafficking missions for over a decade. The "Visionary Artist Award" was presented to Siddhali Shree, Director of "Stopping Traffic", a documentary about human trafficking. An annual international film festival event located in North Hollywood, California, showcasing short and feature films from around the world and offers awards for excellence in filmmaking. The festival was founded by Gustavo Sampaio, an award-winning editor and TV producer as well as an independent filmmaker. North Hollywood CineFest has established itself as a premier event for independent cinema from all over the world. For more information visit nohocinefest.com. The Ministry of Information and Communications Technology is the entity in charge of designing, adopting and promoting the policies, plans, programs and projects of the Information and Communication Technology in Colombia. Among its functions is to increase and facilitate the access of all inhabitants of the national territory to Information and Communication Technologies and their benefits. This entity is led by the Minister of Information and Communications Technology David Luna Sánchez.